Welcome to the Big Lake Road Pedestrian Improvements Study project website. The Department of Transportation and Public Facilities is conducting this study to identify and plan for pedestrian and other non-motorized user safety within Big Lake. This planning study will analyze current conditions and make recommendations for solutions, including prioritizing capital projects, that will enhance safety for non-motorized users to support walk-ability and economic development in Big Lake’s commercial center. The study will also recommend policies that will support future transit opportunities and traffic increases as Port MacKenzie and surrounding communities develop. As the area builds out, it will be important for the study to anticipate future development to preserve Big Lake Road’s function as a minor arterial to move people, goods and services, to and through Big Lake to the rest of the MSB while balancing adjacent property growth and development and non-motorized user needs. 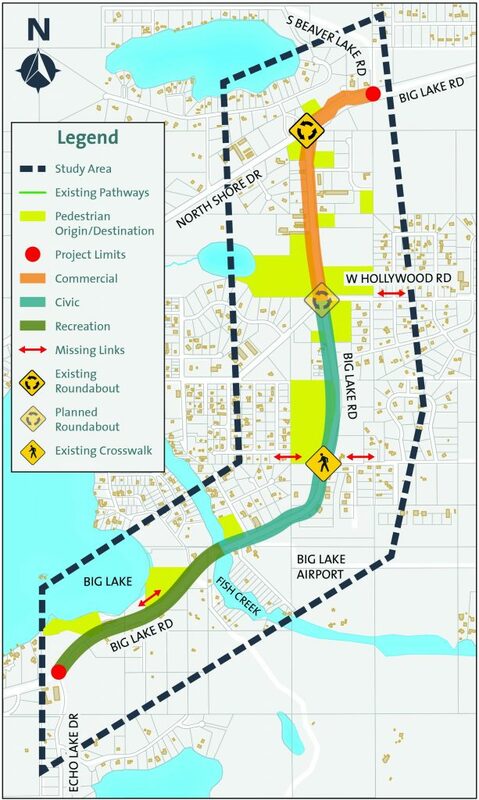 The Big Lake Road Pedestrian Improvements Study will emphasize planning and prioritizing of a safe, accessible and constructable corridor for all users. The study area of the project is anticipated to be a quarter-mile on either side of Big Lake Road, see graphic below. Promote year-round walking within the Big Lake core as an attractive, affordable, and viable choice by providing safe, barrier-free and all weather facilities that improve community cohesion. Reduce conflicts between motorized, including ATVs and snow machines, and non-motorized traffic.